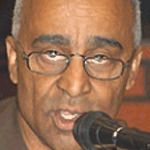 Benjamin Mchie is the founder and executive director of The African American Registry. The Registry is one of the most comprehensive databases of African American heritage online. Mchie is a 1974 Bachelor of Arts, Speech Communication graduate from California State University Long Beach. He is a historian (specializing in African American Heritage) and a speaker for educators, students, corporate and civic organizations. As an Education Consultant through The African American Registry, his organization trains K-12 teachers to be more inclusive of African American heritage in all subjects, everyday.